Samford University’s graduate programs in nursing and pharmacy are ranked among the best in the nation according to rankings released today by U.S. News & World Report. Coming in at number 85 on the Best Graduate Nursing Programs list, Samford’s Ida V. Moffett School of Nursing is ranked among the top 16 percent of all accredited master’s programs in the country. Samford moved up five spots from number 90 last year. 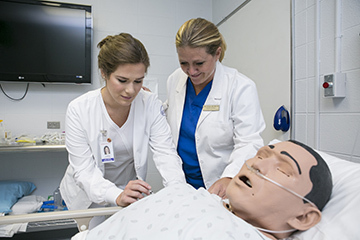 Nursing school rankings are based on quality indicators related to student selectivity, faculty resources, faculty achievements, research activity, and peer assessments of quality and specialties. The nurse anesthesia concentration was ranked #51 in the nation for the specialty and is the highest-ranked program in Alabama. McWhorter School of Pharmacy’s Doctor of Pharmacy program moved up nine spots in this year’s Best Pharmacy Schools, ranking number 53 in the country. Pharmacy school rankings are based on the results of peer assessment surveys sent to deans and administrators in accredited schools of pharmacy. According to Sanders, Samford’s health sciences programs are designed to meet the needs of not only students and graduates, but also the respective professions and the overall health-care community. Both the nursing and pharmacy schools have recently experienced growth in their graduate programs. More than 430 students are enrolled in graduate nursing programs at Samford, with 340 of them pursuing a master’s degree. The nursing school offers master’s concentrations in family nurse practitioner, nurse educator and nurse anesthesia. The school also has an RN-to-M.S.N. option in addition to programs at the baccalaureate and doctoral levels. The school will introduce the RN-to-D.N.P. and B.S.N.-to-D.N.P. options in 2017. McWhorter School of Pharmacy continues to differentiate itself from its peers by offering numerous dual-degree options, including a Pharm.D. /M.B.A. and a Pharm.D./M.P.H., and a variety of opportunities for students to personalize their degree to meet their career goals. This year, nearly 20 percent of pharmacy school students will travel internationally, and numerous students are engaged in research.